This project was so much fun and VERY easy to pull off. As with recipes, I like to gather everything I will need ahead of time, plus at this point I really need to gather TWO of everything. We’ve all seen the dark tarnish that pennies take on over time. 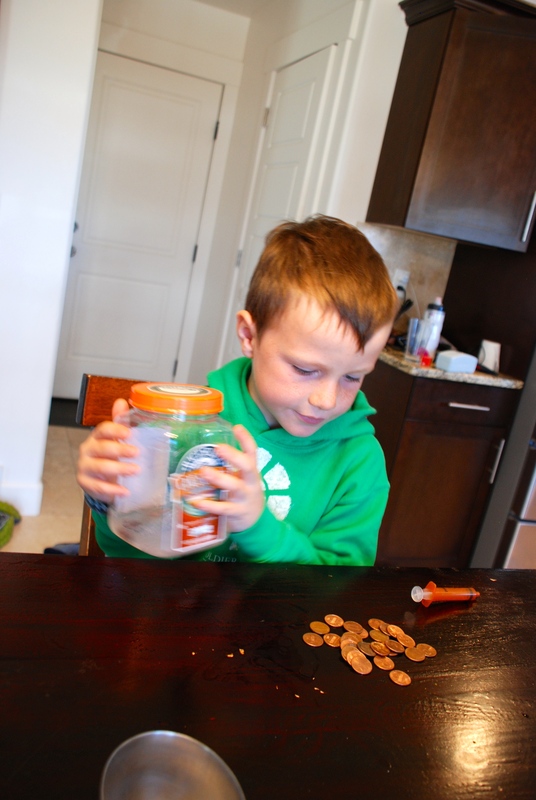 Pennies are (predominantly) made of copper. Over the life of the penny the copper oxidizes due to its reaction with oxygen in the natural environment (there are other oxidizers, but oxygen is a predominant oxidizer). This oxidation causes copper oxide to form on the pennies. 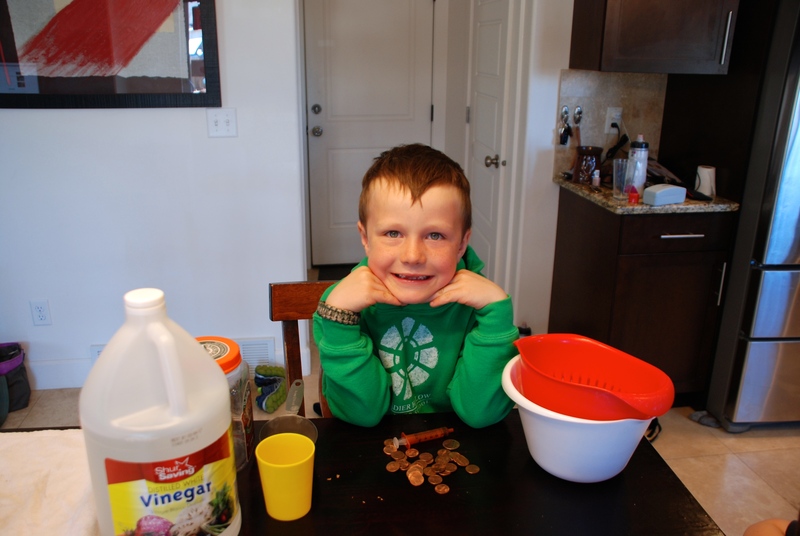 By dipping the pennies into a simple acetic acid solution (vinegar + salt), you can clean your pennies and remove the copper oxide tarnish. 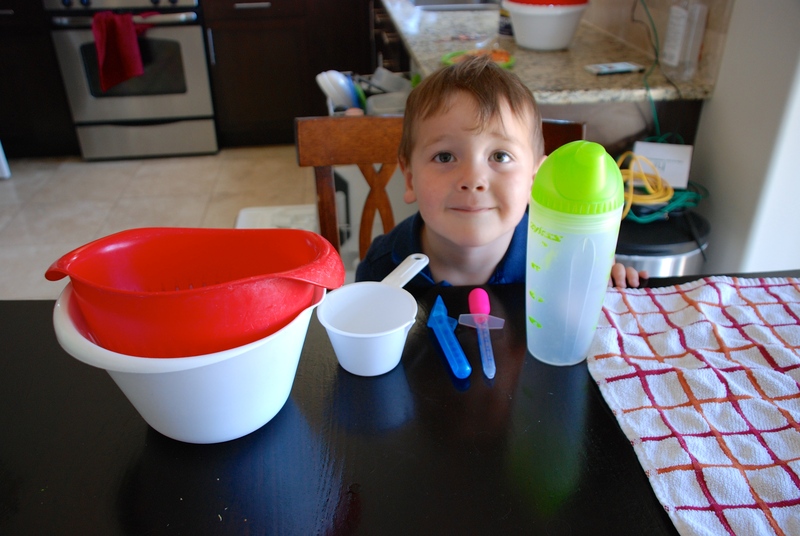 A fun, safe, easy chemistry experiment for your kiddos! 1) Grab your dirty pennies. 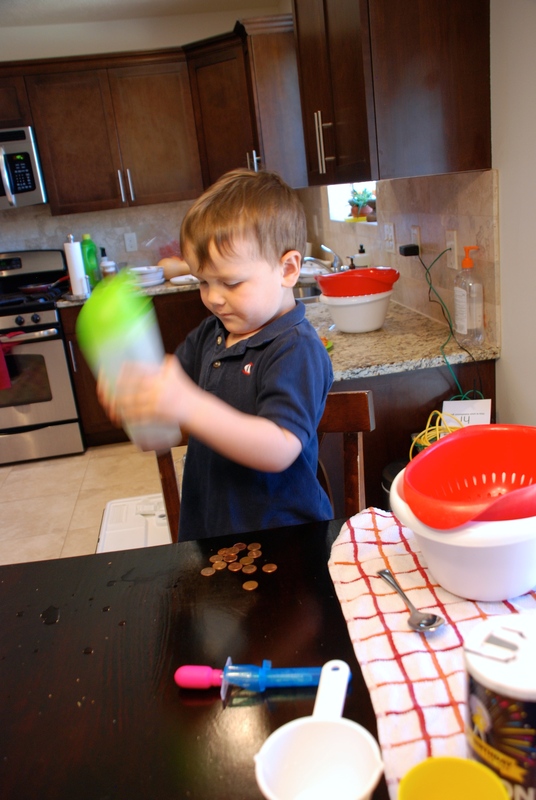 2) Set up your work station on the kitchen table. 3) Mix 1 Cup of Vinegar with 1 teaspoon of salt in your jar or container with a lid. 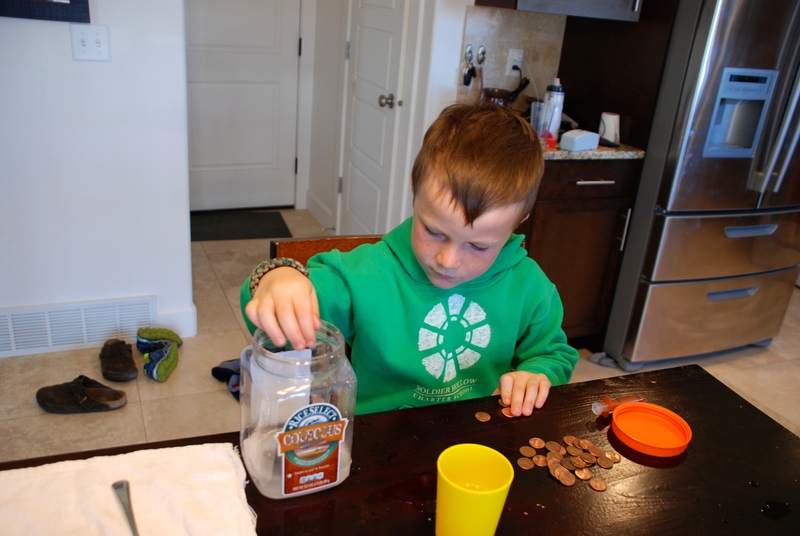 4) Add five or more pennies to the mix. 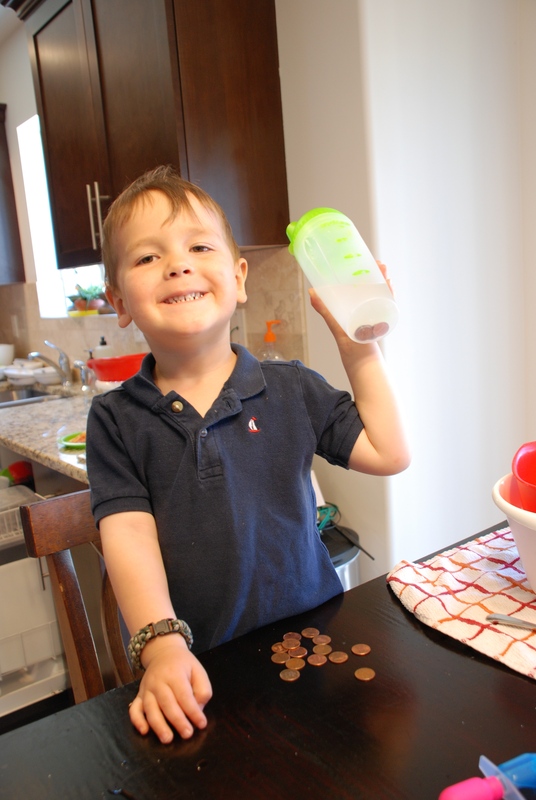 5) Secure the lid to your container tightly and SHAKE! 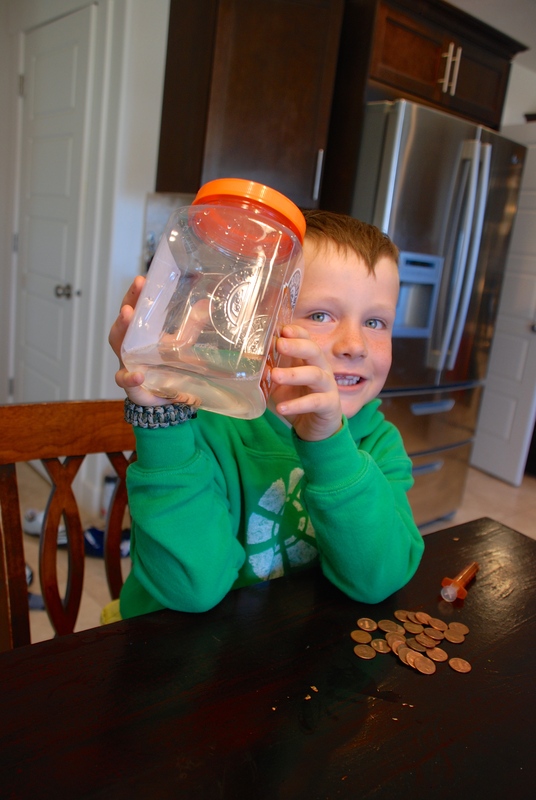 6) Check out your pennies progress inside the jar. 7) Strain your pennies over a bowl. 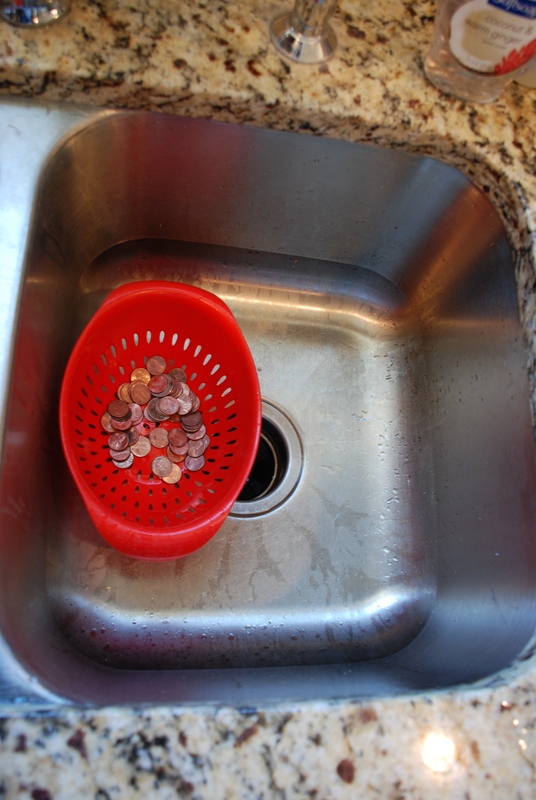 8) Lay your already clean pennies out on a towel. 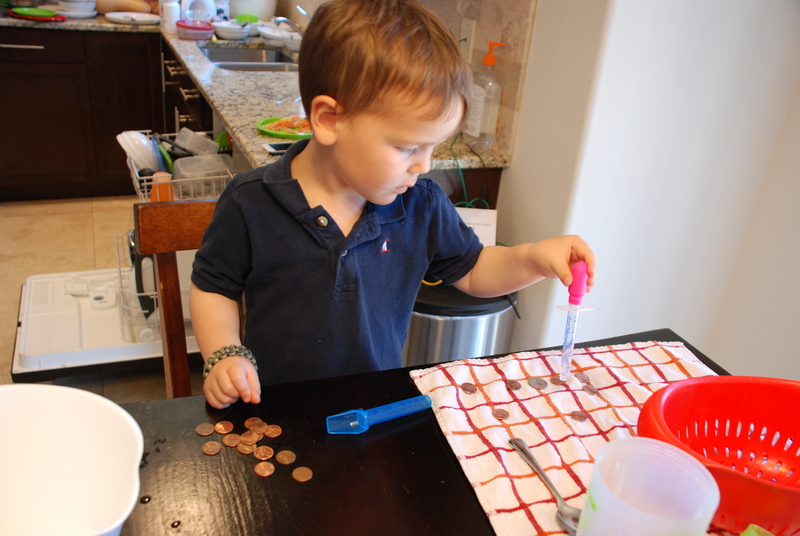 Use the eye dropper to put a more concentrated amount of vinegar and salt on each penny. 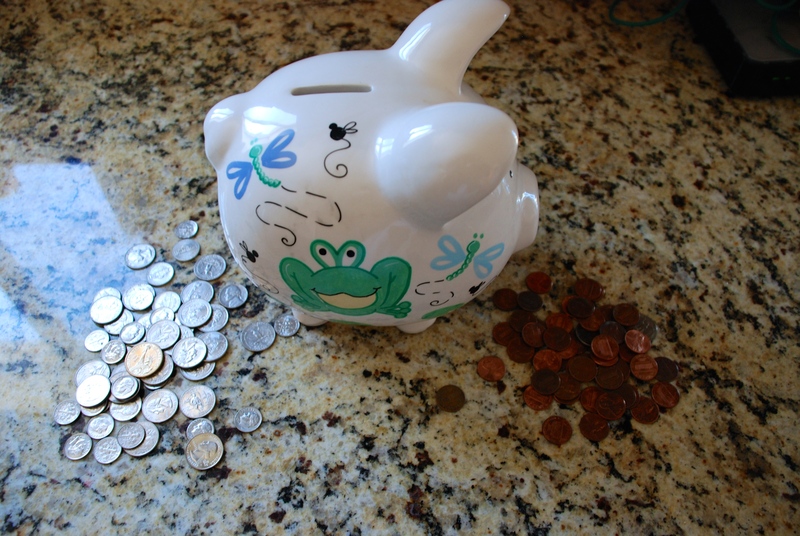 9) Scrub your pennies with a tooth brush to see if you can remove even more copper oxide. 10) Rinse. It’s that easy! Instructions with pictures below. 1) Grab your dirty pennies. As you can see we raided the piggy bank for these puppies! 2. I set each scientist up with their own work station including: jar with lid, strainer, bowl, eye dropper, and towel. 3. Put 1 Cup of vinegar and 1 tsp salt into each jar. 4. Add five or more pennies. 6. Progress. 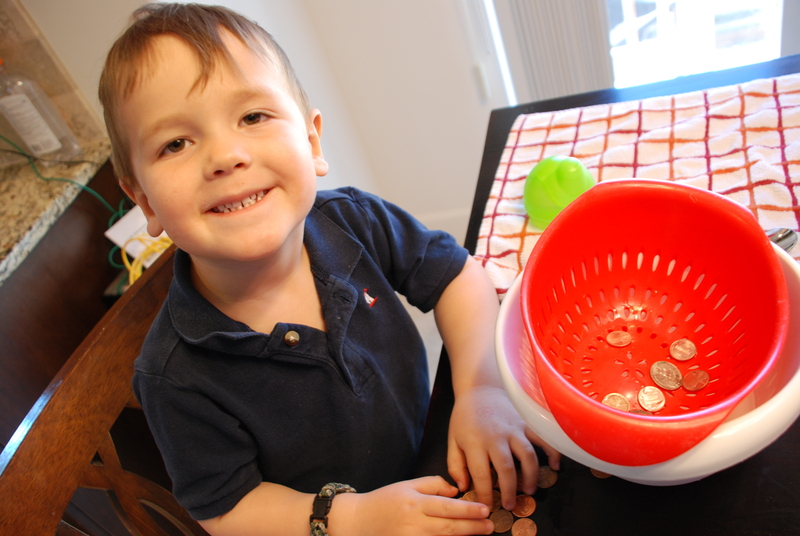 You might not be able to see from the pictures, but the pennies are brighter and shinier already! 7. Strain. 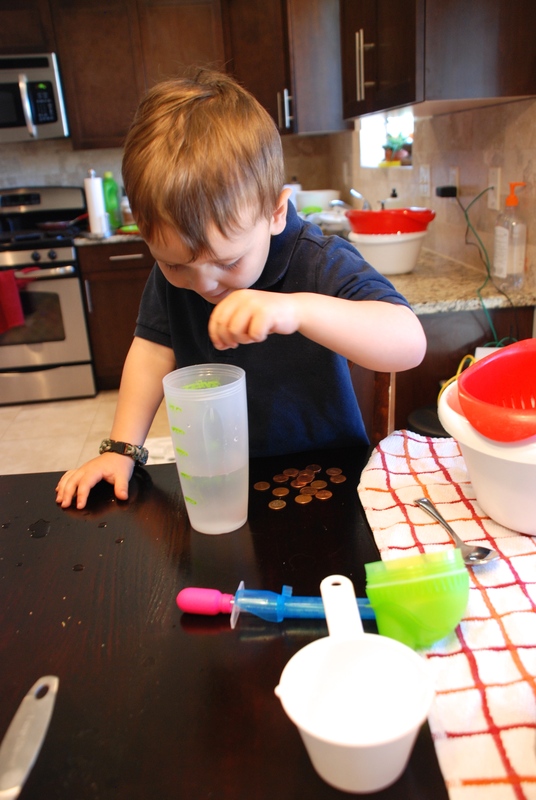 Pour your solution and pennies through the strainer. Take some time to check out the results. 8. More. 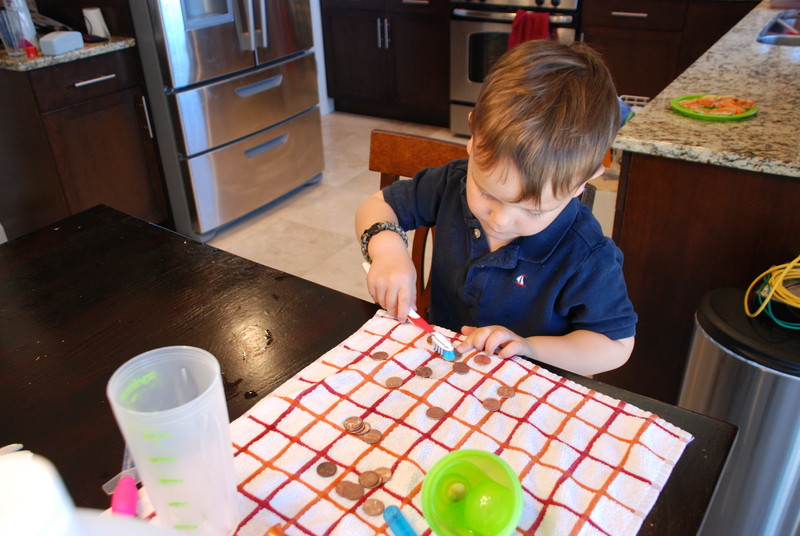 If you want to see if you can get your pennies even CLEANER, lay them out on the towel. 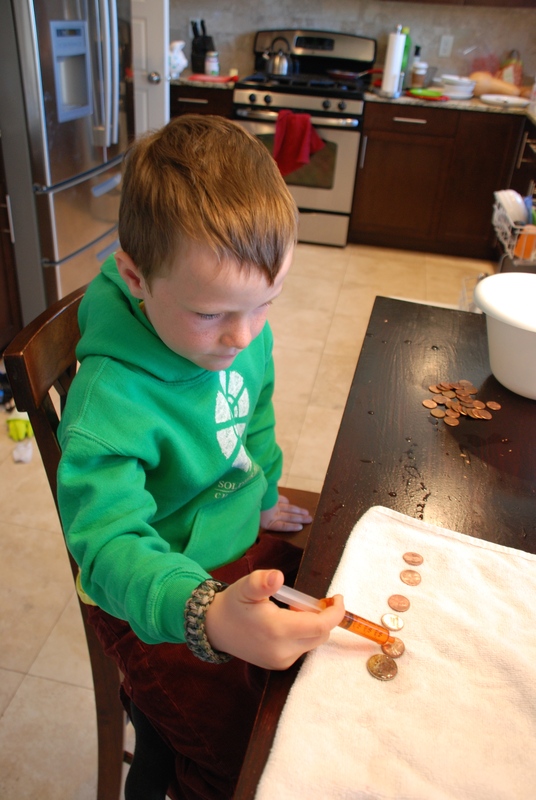 Use and eye dropper or medicine dropper to put the solution directly on the pennies.